Gold prices have not managed to maintain the close above USD1200, with fresh selling pressure appearing just beneath the USD1221.05 high of 22 November. 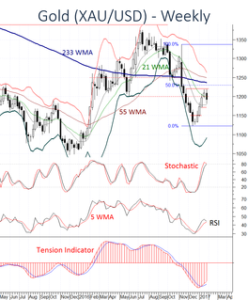 A corrective pullback towards the USD1171.80 low of 9 January is now unfolding, as overbought momentum studies unwind. Any break, however, is expected to stabilise above the USD1150 break level, as the Tension Indicator continues to strengthen and investors maintain a cautious stance. A close beneath here, however, would turn investor sentiment negative, and open up deeper reactions towards critical support at the USD1122.35 low of December 2016. A close above the USD1230, (50%) Fibonacci retracement of the November-December fall is needed to signal a more bullish tone, but any immediate gains should fade beneath here, as short-term studies also track lower.